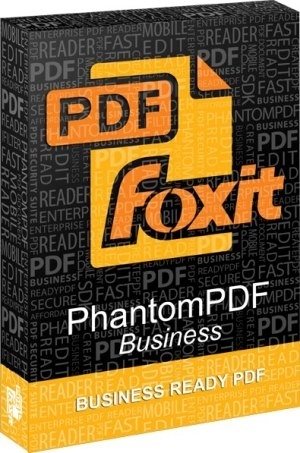 Описание: Foxit Phantom - приложение для просмотра, редактирования и создания PDF документов. Среди преимуществ программы - небольшой размер, высокая скорость запуска и создания PDF-документов. Позволяет производить слияние и разделение PDF-документов, удалять и вставлять новые страницы, создавать электронные формы и примечания и т.д. Предусмотрена возможность конвертирования в формат PDF файлов формата DOC, PPT, TXT, HTML и многих других. Возможно создание PDF-документов напрямую со сканера. [+] "Изменения в версии 7.0:"
[*]Shared Review for Desktop and Mobile Users. Allows document owners to share a document with others to gather feedback/comments from reviewers through internal server, emails or SharePoint. [*]Portfolio Creation and Editing. Supports to create PDF portfolios and edit PDFs and properties in portfolios. [*]Merge Advanced Editor Features into Main Program (Business Only). Contains all the Advanced Editor features and removes the standalone Advanced Editor from the application. [*]Free-form Annotation with PSI (Pressure Sensitive Ink). Supports to use the Pencil tool from Surface Pro or Wacom tablet to add free-form annotations with PSI in PDFs. [*]Document Sanitization. Enable users to remove comment data and other sensitive information that can be hidden or not immediately apparent from PDFs by one-click. [*]Create PDFs from Your Outlook. Supports to create PDFs from email messages or folders directly with the Foxit Outlook Add-in, located in the Foxit PDF tab in Outlook ribbon. [*]2D Barcode Displaying. Supports to display 2D barcode that contains form data in the PDF forms with Ultraform technology. [*]Bi-directional Language Support. Supports to search and input Hebrew and Arabic in commenting and editing. [*]Optimized PCL Printing. Provides an option to auto-detect printers that support PCL for PCL optimization to improve the printing speed. [*]Stronger Security from the RMS Plugin (Business Only). Adds extended policy to strictly control documents access and supports dynamic revocation by preventing some users from accessing PDFs or preventing some PDFs from being accessed to promptly revoke PDFs that have already been issued. [*]Create PDFs with RMS Encryption (Business Only). Allows users to create an RMS protected PDF from Office (Word, Excel, PowerPoint and Outlook), using Foxit add-in. [*]Friendly Ribbon Customization. Supports to customize the Ribbon, enabling users to rearrange the buttons, or create a new tab with their favorite buttons. [*]Streamlined Text Editing by Linking. Supports to link text boxes to a new paragraph ready for paragraph editing in a page to keep better text reflow. [*]Supports to create and verify signatures on dynamic XFA forms created by Adobe LiveCycle. [*]Support to export PDF to Word in Faeroese. [*]Improved Paragraph Editing UX. Retains better text reflow and display after editing with Edit Text tool to improve user experience. [*]Creator Add-in Improvement in PPT, Excel & Word. Adds more options in Foxit PDF tab in the ribbon of the aforementioned applications. [*]Instant PDF or PDF Portfolio Creation. Improves the “drag and drop” and “copy and paste” features to create PDFs or PDF portfolios quickly. [*]More Secured Digital Signature. Supports to add password encryption to your digital certificates to avoid unauthorized use. [*]GPO Improvement. Ensures the configurations in GPO template to work in both Classic and Ribbon Mode, adds settings of language in XML and GPO template, and more. [*]SharePoint Network Drive Support. Enable users to open and check out PDFs from SharePoint mapped drive with Foxit PhantomPDF’s Open dialog. [*]Text Copy with Formatting Maintained. Improve the “Copy and Paste” feature to allow users to copy and paste text with styles, including font, font size, font style, font color, etc. [*]Fixed an issue where the "Repair" button did not work properly in the Windows Add/Remove Programs menu. [*]Fixed an issue where an error prompted when users emailed a file with CJK characters in the file name if Windows locale was set to English. Пожалуйста, удаляйте предыдущие версии перед установкой новой.